Each Tube Box includes: Instruction Guide, protective sleeve, cable tie, details of acceptable products, Collection report and pre-paid envelope. Tubes accepted: All fluroescent tubes typically used in household, school or office environments. Including Linear Flourescent Tubes (T5, T8 & T12), Fluorescent U-Tubes, Compact Fluorescent Lamps (CFLs), Mercury Vapour Lamps, Metal Halide Lamp & Sodium Vapour Lamps, UV Lamps, LED tubes and Neon Tubes. The EcoActiv Globe & Tube Recycling service provides a low-cost and environmentally-considered solution for keeping globes and fluorescent tubes out of landfill and ensuring any toxic chemicals are safely recovered. These items also contain valuable materials such as aluminium, glass, phosphors and mercury, that can be recovered to reduce the use of finite natural resources. Subscribe – Purchase the prepaid EcoActiv Recycling service from our online shop. 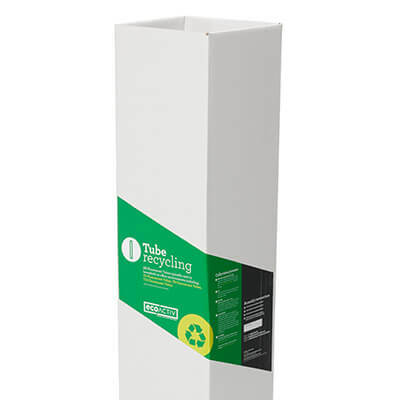 Once your order has been processed, an EcoActiv Globe or Tube Collection Box will be dispatched within 5 working days. 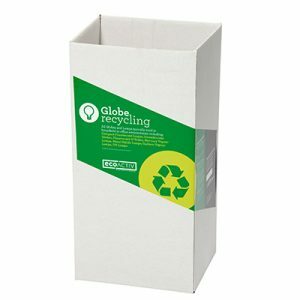 Fill – Place your Collection Box in a prominent to promote and encourage the recycling of globes and/or tubes. Secure – When the Collection Box is full, seal the plastic inner sleeve with the included cable tie and seal the box with adhesive tape to ensure that it’s safely sealed for transport. Return for recycling – Call EcoActiv on: 1800 489 278 or email: info@ecoactiv.com.au to arrange a pick-up for your full box. Globes and tubes collected through EcoActiv are safely transported to a specialist facility where they are processed in purpose built crushing equipment. The mercury is extracted through a distillation process ready for reutilisation. The crushing and separation process also extracts aluminium, glass and phosphor powders so they can be reused in new products and applications. EcoActiv Recycling solutions are managed by Infoactiv Group, a specialist product recovery and environment stewardship organisation that is focused on environmentally sound supply chain solutions for consumers, business and government agencies. Infoactiv is a member of the Global Product Stewardship Council and the Waste Management Association of Australian, and has an Environmental Management System that is independently certified to ISO14001. Used globes and tubes are potentially hazardous, so they need to be stored and handled carefully. They need to be kept out of reach of children. Some of the materials are toxic, so you need to be careful of damaged or broken items.